Subject: Will FB Earnings for Q1 2015 Beat Estimates? FB earnings whisper numbers are EPS of $0.46. Both would be comfortably better (by 67%) than EPS of $0.24 reported in the same quarter a year ago. Q1 2015 EPS forecasts, however, are markedly lower than what FB reported in the prior quarter. In Q4 2014, FB posted EPS of $0.54, handily beating expectations of $0.48. Revenue came in at $3.85 billion, versus estimates of $3.77 billion. That was a strong 49% year-over-year (YOY) increase. Monthly active user (MAU) count grew to 1.39 billion, beating the expected 1.38 billion. Investors shouldn't expect such robust numbers when the social networking giant reports Wednesday. Nonetheless, analysts remain upbeat on FB earnings and stock. Here's a look at what FB investors should pay attention to in the April 21 FB earnings report. At the last FB earnings report, the Menlo Park, Calif.- headquartered company cautioned expenses could grow between 50% and 70% this year. The Facebook stock price slipped 2.8% in after-hours trading following that news. 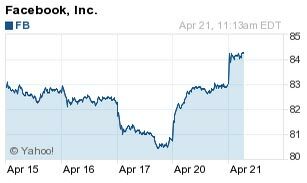 FB also said its 49% YOY revenue increase would have been 53% it not for the effects of foreign exchange rates (a surging U.S. dollar). Chief Financial Officer David Wehner warned that if the exchange rate remains as is, revenue could be affected as much as 5% in 2015. The greenback's 22% rise in the past 12 months has been cited as the reason behind the recent spate of soft earnings from a number of companies with global operations. A rising U.S. currency shrinks the value of foreign profits when they're converted to dollars. Additionally, Chief Executive Officer Mark Zuckerberg said 2015 would be a "major investment year" when FB released Q3 earnings results in October. Wasting little time, and true to its word, FB announced its first acquisition of the year on Jan. 6 with the purchase of voice recognition startup Wit.ai.